Most of the time, if you carefully understand the use case for your “mobile app” you will find that web application is the best way to go. Sure if you’re Amazon, FaceBook or Twitter you clearly have the budget and use case for building native “mobile app” programs for all the major smart phone and tablet models. But what about the rest of us? If your organization is thinking about building a “mobile app” the process can be daunting. You have to develop for at least two platforms iOS and Android. Then field complaints from the Blackberry, Firefox phone, Windows Phone people who feel left out. What if you could build one piece of software that can target all these platforms and eliminate or reduce the red tape you have to go through with each platforms’ app store? Well a web application can do this. All these platforms can interact with pages. So be carefully building a website with the right responsive design, now you can target all these platforms with one code base. While that’s great from the start it gets better as you evolve and add to your application. Now instead of having to repeat the changes to multiple sets of programming code, you only need one set of code! Plus it will run on good old Macintosh and Windows desktops and laptops too! To learn more about what a system like this will cost. Contact WSI today. 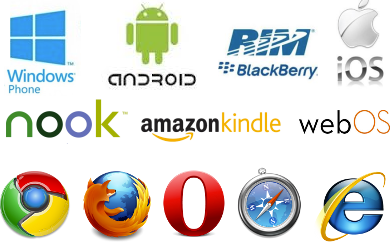 Be up and running faster than your competition on all of these platforms!